Add something blue to your day with this sweet garter set! 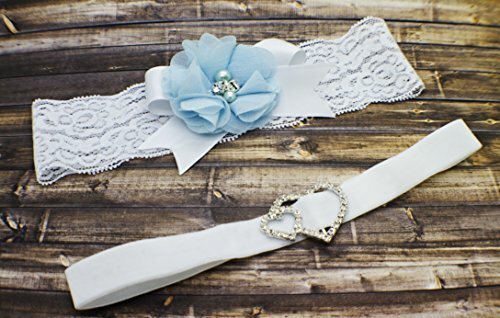 The keepsake garter is made of 2" wide white stretchy lace, adorned with a white satin ribbon and baby blue chiffon flower. The toss garter is made of 5/8" white soft stretch velvet ribbon decorated with a beautiful and sparkly heart buckle. There are color options for the lace (drop down menu). The velvet garter is white. Measuring your thigh: 1. Use a soft measurement tape or a piece of string and a ruler. 2. Measure where you would like to wear your garter, usually 3-4 inches above the knee. ( We will adjust measurement for the toss garter) 3. Take your measurement standing up and don't take off or add extra inches. 4. Select Measurement from drop down menu. If you have any questions about this product by G Squared Designs, contact us by completing and submitting the form below. If you are looking for a specif part number, please include it with your message.